Delight Your Customers This Holiday Season--Do Everything Differently! Okay, maybe not everything, but if research shows anything it’s that today’s shoppers are not interested in Christmas shopping of yore. Engaging, educating, dynamic displays are winning eyes over the hand-written, static (read: boring) signs from our childhoods. Chances are your shoppers found your store online, using a digital display. It’s even likely that they will have a mobile device in their hands while shopping. We live in a Google world where information is available at our fingertips when and where we need it--why do you think your aisles can be the same ol’ same ol’ and continue to drive business? Static signage provides simple, high-level information, and, chances are, stores using shelf tags are using tags that do not incorporate store branding such as font and color. Customers who have made a connection with your branding will be lost with bulk-order, handwritten tags. Tablets can be adjusted to the right brightness for their location for presenting your product information and promotions to interested customers. Besides being eye catching, in-aisle tablets quickly engage audience. Sellr Tablets bring up tasting notes, pairing recommendations, and recipes alongside a high-quality image for more than 160k products--all with a quick scan of the product’s barcode. Try that with a shelf tag! Tablets are updated easily with a drag-and-drop app that makes fast work of featuring new products, categorizing seasonal items, and keeping content fresh so each visit is as engaging as the last. Once shoppers find the right products for a recipe that catches their eye, give them a chance to use it later. Sellr Tablets let customers text the recipe or email it. This kind of product engagement increases upsell and keeps your business top-of-mind even after the customer leaves the store. The 2017 holiday shopping season is transformed from the days of yore. Digital is driving the customer experience and the customer expects to be delighted. 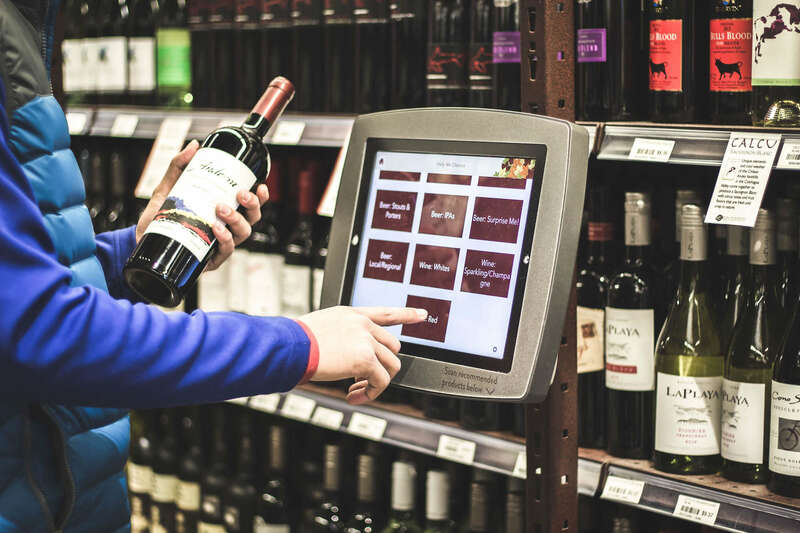 In-aisle tablets provide the kind of displays, product education, and engagement your shoppers are used to. Tablets change the way you share product information with your shoppers. The in-aisle experience creates a modern shopping experience that differentiates your business and sets the bar for 2018. Click here to learn more about in-aisle education with Sellr Tablets.